Lord knows parents have plenty to worry about. 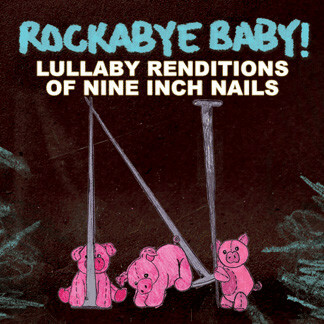 Here’s one fear that seems to be on a lot of our Gen X and Y minds: how can we ensure our children will share our exceptionally good taste in rock music without them swearing like teeny-tiny Osbournes or whining about getting them full-sleeve tattoos for the first day of kindergarten? But angst over balancing rock’s musical legacy with parenthood goes the other direction as well for many rock musicians as they ask themselves, how can they raise kids and stay true to the music they love? A few weeks ago I got around to seeing the 2011 documentary, The Other F Word, featuring interviews with kings of the West Coast punk rock scene, from Flea of the Red Hot Chili Peppers to Mark Hoppus of Blink-182, about their unique and optically bizarre position as role models for their fans as well as their children. It is much more than helping their daughters pick the prettiest skulls-and-hearts skirt to wear to daycare before rehearsal. The vast majority of these guys are driven by a desire to being the fathers they never had: attentive, affectionate and present. They have to tour regularly, taking them away from their families for weeks at a time so they scream about anarchy and adolescence at their concerts. Plus, they are still trying to make a living in a genre that is defined by teenage male anger and rebellion, now that their own youth is decades in the past and their personal priorities have done a 180. If you haven’t seen this film, find it; it’s worth it just to see Rancid’s Lars Frederiksen, facial tattoos and leopard-spot hair and all, playing with his toddler at a San Francisco playground. 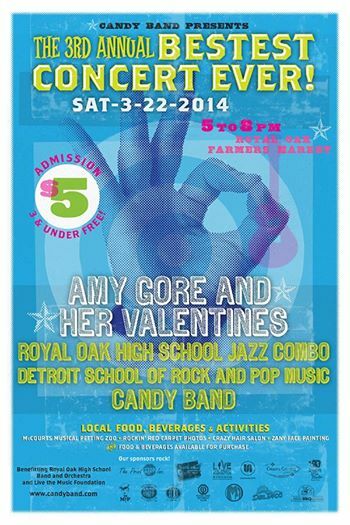 Headlining the gig was Amy Gore and Her Valentines, who my cousins knew from her days leading the Detroit garage band Gore Gore Girls. In her current outfit she has scored kudos from Little Steven himself, who named their song “Send Me A Postcard” his COOLEST SONG IN THE WORLD on an episode of his Sirius radio show. I’m guessing this was not her typical gig. Rocking a leather catsuit and a gorgeous white guitar, Ms. Gore looked out to the kids at the lip of the stage and said, “This is the cutest crowd I’ve ever played for. You’re killing me with cute here.” Were they ever. A pair of identical twin boys with Spider-Man face paint were enjoying their own mosh pit of two, throwing fake punches and wrestling each other to the beat. A young couple – probably the pride of the second grade – were attempting to ballroom dance to the strains of “Good Girls Don’t.” And there was our little cousin, with purple temporary hair dye and Ziggy Stardust face paint, grooving to the music. P.S. Thanks to the many of you who have found a spot for my novel, Love and Other B-Sides, on your e-readers. If you have a sec, how about adding your review? And if you haven’t gotten your copy, drop on by Amazon and download it today! I caught a showing this weekend at the Detroit Film Theater of Beware of Mr. Baker, the terrific documentary about Ginger Baker, the notorious wild man drummer behind Cream and Blind Faith. Find it and see it if you can; it’s unforgettable. 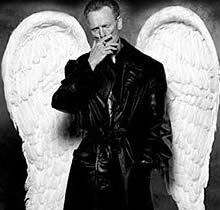 In his younger days Ginger Baker was terrifying to behold: flame-haired; rangy; bug-eyed; tightly coiled and lashing out without warning like a poisonous snake. Now in his seventies, he is rage turned obsidian: dark, opaque and cutting. His bitterness – over past grudges with musicians in every outfit he ever played for, the inconveniences of family and business partnerships gone sour, and his ongoing financial turmoil fed first by his drug habits then by his love for polo ponies – swirls around his head with every exhale of cigarette smoke. Even his documentarian didn’t escape unscathed: the film opens with Baker threatening director Jay Bulger with bodily harm if he talks to anyone else about his life, punctuated with a blow to Bulger’s nose with his cane. The incredible music he creates begs us to forgive Ginger Baker for his multitude of sins. Baker threw his entire being into his performance. Even when on drugs he was a control freak, working himself into a maniacal lather to serve his precise sense of “time.” Eric Clapton scoffed at anyone comparing him to the lesser likes of Keith Moon or Jon Bonham: he knows his former band mate as a consummate jazz musician and exceptional composer and arranger. He’s garnered an impressive list of admirers, and drummers including Stewart Copeland of the Police and Chad Smith of the Red Hot Chili Peppers credit Baker with inspiring their musical careers and saving their teenage souls. Jack Bruce, the bassist and lead singer for Cream, was interviewed about their collaboration – and constant feuding – in a tastefully appointed room in what was presumably his home. His hair was as black as his spotless leather jacket, his demeanor sane and secure. And yet, no matter how brilliant he was as a musician, there will never be a documentary called, “Be Glad for Mr. Bruce.” No one would want to see it. There is no shortage of troubled rock legends who continue to fascinate, whether they died young or are celebrating their 50th anniversary with Mick and the boys. Yet Ginger Baker’s life story left me unsettled. He has no use for relationships, or love for humanity. Anyone who extended him a hand in friendship had it slapped, or bitten off. He only finds joy in the midst of performance, and even that doesn’t last long. Now when I listen to his music, I won’t be able to ignore the brilliance of his drumming … or forget his cane slamming into Jay Bulger’s face. 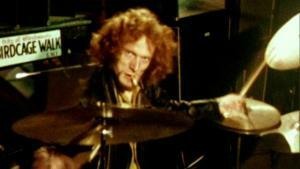 What is the true meaning of our hero worship of someone like Ginger Baker? After all, Lucifer was once an angel, too.